It's summer. You've been waiting for this season all year and now the world is filled with warmth and good times. However, with these good times come unwanted visitors. Indoors and outdoors, bugs reign supreme and it seems that nothing can be done about it no matter how hard you try. That's why Tregini has got you covered with our electric fly swatter - the best way to take back control of your home and end the rule of mosquitoes and fruit flies.PRODUCT FEATURES Plastic Electric Fly Swatter - Tennis Racket Shaped Safe-to-Touch 3 Layer Mesh Net 4,000 Volt Ergonomic Handle and Grip Built-In USB Rechargeable Battery With Included USB Charging Cable LED Flashlight for Eliminating Pests in the Dark Keeps Mosquitos, Gnats, and Other Flying Insects Away! Large: 19.5" x 8.25" Mini: 17" x 6.25" A FAST AND EASY SOLUTION TO YOUR BUG PROBLEMWhen bugs, mosquitoes and flies enter your home and annoy you and your family - playtime is over. With our electric bug zapper you're taking back control of your home and not letting pesky insects turn it into their amusement park. With 4,000 volts and comfortable grip, all it takes is a simple wave and press of a button to take them out. No need for expensive repellents and traps you need to buy again and again. Our swatter offers you a fast and easy solution!The swatter itself is rechargeable and comes with a USB charger so you can always have it handy. In the dark? Turn on the LED light function that's built-in the racket for low visibility extermination.DURABLE AND SAFEDesigned to last you a lifetime, our swatter is not only sturdy but supremely safe to avoid accidents. 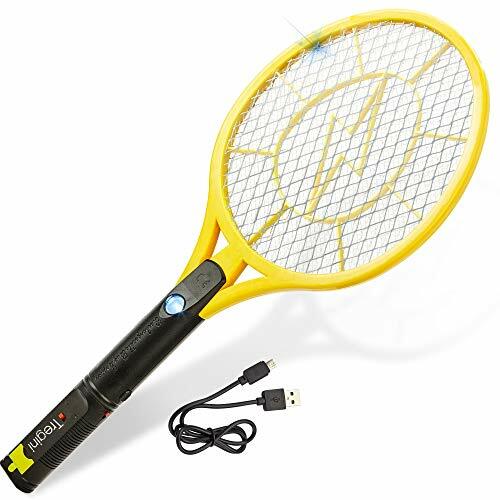 The net has 3 layer mesh protection that blocks any electrocution done to human skin so you never have to worry about accidentally zapping yourself or a loved one.Get your electric fly swatter today and zap your troubles away! ZAP PESTS IN AN INSTANT: With just a flip of a switch and a flick of the wrist all sorts of flying insects such as gnats, fruit flies, and mosquitos are zapped clear from the air with our 4,000-volt swatter! RECHARGEABLE FOR LIMITLESS USAGE: Infinitely keep bugs at bay with our electric fly swatter that is conveniently rechargeable so you can always have it handy without worrying about replacing batteries. SAFE TO TOUCH: Don't worry about zapping yourself! Not only does the zap function require a button press and can be turned off but if you were to touch it while electrified, triple mesh layers protect you! BUILT-IN FLASHLIGHT: For low visibility nights or just out in the dark, our swatter has a built-in LED light that shines bright for you to see you to take down mosquitos and pests anywhere, anytime. A TIME A MONEY SAVER: Avoid the purchasing expensive fly traps and ineffective repellents over and over again and get a bug remover that is fast, easy, and saves you a lot of money in the long run!